The 21st Century has heralded a rapid growth in information and changing circumstances for our students. It is no longer sufficient to provide them with knowledge when that knowledge is out of date within years of being taught. To be successful, what our children require is to be able to learn the process of thinking and learning … to be flexible and adaptable, be excellent communicators, resilient, team players, have ICT skills, and learn how to learn. Mount Alvernia College’s learning program is based on our commitment to achieving excellence through endeavour. The Learning and Teaching Framework offers girls an extensive and diverse range of opportunities at every level of their schooling to help nurture the confidence and skills required to take advantage of them. Offering a best-practice learning environment, every effort is made at Mount Alvernia to give our students the resources and support they need to pursue their goals according to their individual gifts. Our Learning and Teaching Framework provides a safe learning environment guided by six core principles: share practice, realise potential, forge connections, enable excellence, build resilience and engage learners. Our key intent is to engage learners as this will ensure success at every level and stage of the girl’s Mount Alvernia journey. Our girls are encouraged to explore a wide range of programs as they develop their skills in an environment of dynamic, engaged learning. The College provides a comprehensive curriculum that caters for diverse needs and interests with a broad array of subject choices. We also strive to develop in each student a love of learning, a strong work ethic, self-discipline and motivation, and a commitment to her studies. The curriculum incorporates a wide range of learning that aims to prepare students for life, further study and employment. 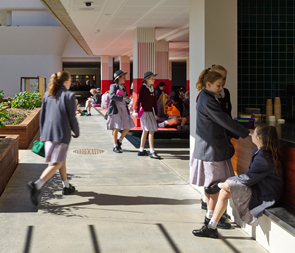 Students are prepared for post-school life through a coordinated and integrated Personal Development Program that operates from Year 7 through to Year 12. A balanced program of preparation for NAPLAN, the Queensland Core Skills Test, and for Queensland Tertiary Admissions Centre applications is provided. Career and work education is part of the comprehensive and diverse experiences available to students. Students are guided in their subject selection and course planning, with individual interviews for students and their parents if needed, information evenings, and detailed subject handbooks. Course guidelines ensure that each student undertakes a broad, balanced and appropriate curriculum, with increasing choice, flexibility and decision-making as she progresses through the year levels. The curriculum is responsive to the needs and interests of our students and new subjects are introduced where there is sustained demonstrated demand. Over the following pages we outline our curriculum for each of our year levels as well as our co-curricular activities in sport, music and other programs.